Well, this past week the weather has been so beautiful here in the Maritimes that I have been spending most of my evenings outside and have forgone the brush. Well, last night that ended as I couldn't bear the look of the half painted venom, primed Lelith and almost-complete DM marine looking at me, with sorrow. So, here are the results from last night, let me know what you think! More pics are up on my blog, hoping to get some better ones of the Venom this weekend. Well not too much to really comment on... Just a lot of base coats. I do like the hazard stripes on the chainsword and the blue glow looks good but its a tad blurry. Sarkastik wrote: hoping to get some better ones of the Venom this weekend. Just loose the curtain in the background there and your camera will focus on the mini. Couldn't hurt to use a piece of white paper in the background too. I'm digging the light Dark Eldar. It'll be a nice change from all the black everyone else has. Why oh why does the Skaven make me think of Master Splinter? Blue wrote: Well not too much to really comment on... Just a lot of base coats. Yeah, most of my Painting lately has been basecoating.. hoping to make some more progress shortly. And yeah, I had been using my window ledge for a while, but I didn't realize how much the trim got int the way.. going to have to find another place to take pictures.. and thanks! it was my first attempt at hazard stripes! Smartah wrote: I'm digging the light Dark Eldar. It'll be a nice change from all the black everyone else has. Thanks! I wanted to try something different... we'll just have to see how it turns out! Lady_Soria wrote: Why oh why does the Skaven make me think of Master Splinter? Holy crap you are right! Why didn't I see that before?!! Well, got some more work on Lelith and the venom tonight, hopefully will have some pics tomorrow. Was able to get some progress done on Lelith and just have some detail work left to do. A few more pics up on the blog, and also got some updates from a friend who has started both Orks and Daemons. looks great so far...I hate to seem like I'm on a theme here, but the colours in the photo make me think of April o' Niel in the 80s cartoon. That's funny! I forget if it was Eastman or Laird, but one of them was actually dating and I believe briefly married to April O'Neil, hence her being in the comics and show. Lady_Soria wrote: looks great so far...I hate to seem like I'm on a theme here, but the colours in the photo make me think of April o' Niel in the 80s cartoon. Thanks! Haha, well, it wasn't intentional! 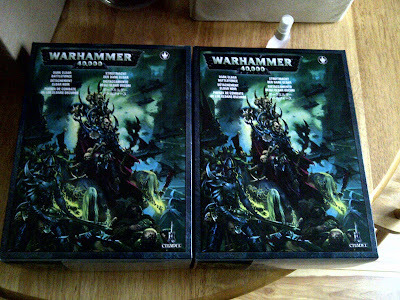 well, this weekend was mostly assembling, as I received a box of warriors and scourge. hopefully tonight I can get the second half of the warriors assembled and start priming. hopefully tonight I will be able to get them primed / base coated, along with my scourge. I love Scourge! Looking forward to seeing some painted pics! Well, its been a while since I have posted... Kinda got into a painting slump near the middle of the month with RL commitments and the Diablo 3 beta distracting me, but I did manage to get my deathmatch mini done and have been getting the starting layers done on the rest of the Warriors and Scourge. Also, over on my blog, I have started a point-based goal system with my friend Kroxx. It doesn't use the GW point value, but instead uses an arbitrary value depending on size of the model. For example, an infantry model is worth 1 point while a transport would be 10 points. Anyways, I have set a goal of 15 points which would see the rest of my Warriors and scourge done by the end of May... should be interesting. I am hoping to update more than I have this past month, so we shall see.